Premise: Modern cult classics usually get cancelled before people start cosplaying, writing fanfic, and organizing conventions. Hypothesis: Somewhere deep within the inner sanctum of NBC’s programming department a cabal of executives know this to be true. Therefore they are artificially playing with Community’s fate to help generate cult status for an existing show. Evidence: Inspector Spacetime the web series. The series itself will feature the Inspector and Constable Reggie battling the Inspector’s arch-nemesis, Boyish the Extraordinary. A dramatic reading of the first episode’s screenplay at Gallifrey One also revealed an impending conflict with the Blorgons on planet Second New Old Earth 7. Richey is no stranger to web series production. His resume includes, Smiley Town, 2 Hot Guys in the Shower, a series of award winning Mac vs PC spoofs and the hilarious series Robot, Ninja, and Gay Guy. At this point, no one involved in the production will be paid for their work, and no one will make one dime off the finished product. There won’t even be ads on the Youtube videos. We’re making this show because I know fans want to see it. I know, because I’m one of them. This also keeps the project rooted in the realm of fan culture; an important caveat should my premise prove faulty and the NBC overlords ponder suing Community’s fans for creating an homage to the series. 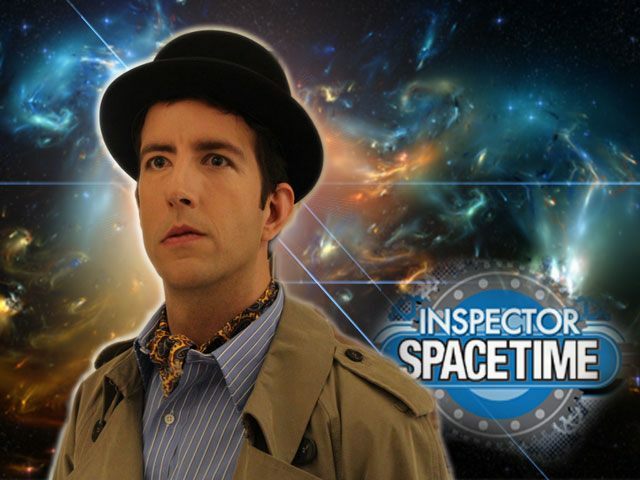 Look for Inspector Spacetime to hit the internet in June of 2012. Here’s a link to the kickstarter page should you feel a desire to be streets ahead and support the series. Image via Inspector Spacetime’s Facebook Page. UPDATE: As I was writing this post, Dan Harmon tweeted that Community would be returning to its 8pm slot on Thursday nights as of March 15th. Streets Ahead!